During christmas time , we usually bake a lot of cookies , i did this time , but not as many as i used to . I was a little procrastinating this year , i even forgot to send some goodies to friends out of state . And on top of that i did not make butter cookies for my family to decorate . Yes , i was that bad , i was also sick for almost 2 weeks during the month of December . Actually was a really bad cold , and i started to feel better just days before christmas . But anyway , to make up for it , that Christmas Eve morning , after coming home from working out , i told my son , who just turned 10 years old that he should pick out a recipe from this christmas baking book , and i will help him to bake it . He chose brownies recipe , maybe because it’s the first recipe on the first page or whatever his reason was .. he picked that one . Okay .. great no cookies , less mess , quick to make . 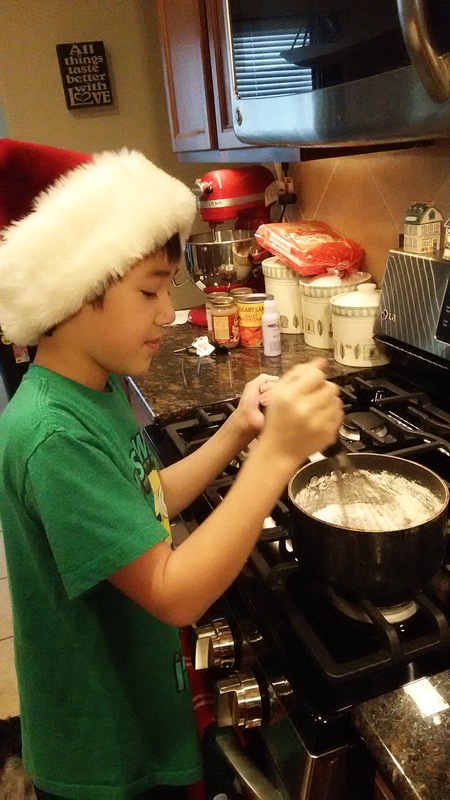 I let him do everything himself , i only helped measuring the ingredients , he would pour , stir , and mixed it all himself . Set the oven temperature , putting it into the oven ( nervously ) and took it out and even made the frosting . 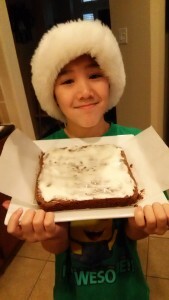 The brownies turned out really yummy .. so i decided to keep it here online , so anytime i want a brownie recipe , this should be my go to brownies ! 1. Grease square dish 8×8 , line with parchment paper , grease with shortening , set aside . Set oven temperature to 350 F .
2. In a small saucepan , combine sugar , butter and water . Cook and stir over medium heat until mixture boils . Remove , and then , add chocolate pieces , stir with whisk until melted , add eggs and vanilla , whisk well until just combined . 3. 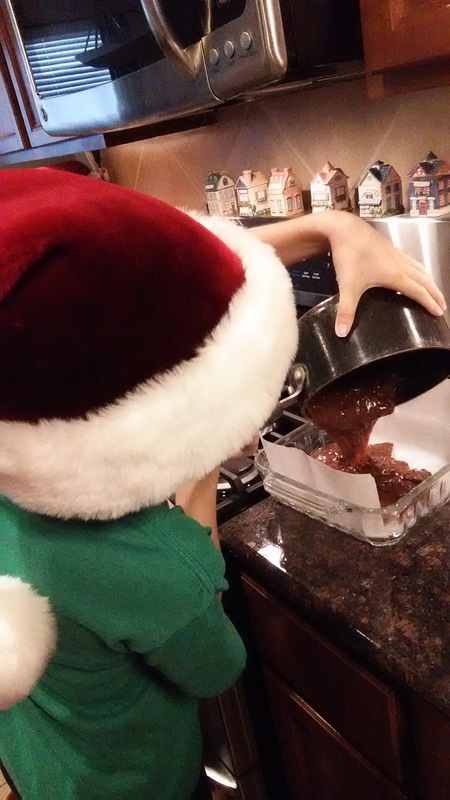 Combine flour , salt and baking soda , stir into the chocolate mixture , stir until combine , add pecan . Pour into the baking dish . 4. Bake for 20 minutes or longer until edges are set and pull away from the pan . Might take a little more than 20 minutes . 5. Using fork , poke brownies all over , and sprinkle with the bourbon . In a small bowl , beat 3 tbsp. of butter with mixer high speed for 30 seconds . Gradually add 1 1/2 cups of powdered sugar , 2 tsp. milk and vanilla . Adjust the consistency by adding more milk if necessary . Spread on top of cool brownies .